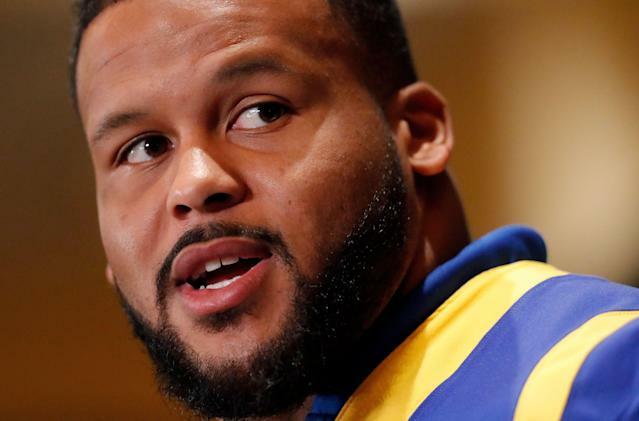 Former Pitt defensive tackle Aaron Donald is giving back to the Panther football program. The school said Friday the Los Angeles Rams star had made a “seven-figure” gift to the school. The donation is the largest ever by a former Pitt football letterman and makes Donald, 27, the youngest person to donate over $1,000,000 to the university. "It was a dream come true to play for the University of Pittsburgh," Donald said in a Pitt statement. "My experience as a Panther is something that influences my life every day and I want to pay that forward. I believe in what Coach Narduzzi is building at Pitt and this was an opportunity for me to make a difference for our current and future players. Pitt will always be my school and I'm honored to be able to support the Blue and Gold." Donald’s donation means that the bottom floor of Pitt’s practice facility will be renamed the “Aaron Donald Football Performance Center.” The area includes the team’s weight room and training room. "Aaron's favorite saying is 'Hard work pays off,' and his incredible success is certainly a testament to that motto," Pitt athletic director Heather Lyke said. "The wonderful thing about Aaron is how he shares his success with others. Even while playing for the Los Angeles Rams, he remains passionately invested in both Pitt and Pittsburgh. The work he puts in daily at Pitt shows our student-athletes the commitment necessary to succeed at the next level. Aaron's gift to Pitt football truly comes from the heart and we are tremendously grateful for his generous commitment to our football program's future. As a player and person, Aaron Donald continues to set the highest of standards of what it means to be a Panther." Donald, a back-to-back Defensive Player of the Year, signed a six-year contract extension with the Rams ahead of the 2018 season. The contract included nearly $90 million guaranteed and is the richest ever for a defensive player.